EVE is known for its "learning cliff". Since we all care deeply about new players, it is our responsibility to educate the EVE public so that they can climb the learning cliff. Some players learn from EVE University, while others put themselves through the proverbial School of Hard Knocks. But the most prolific educational institution in all EVE is the New Order of Highsec. Education is one of our highest priorities. But with tens of thousands of highsec carebears to teach, there's only one way to do it efficiently: In bulk, with forms. 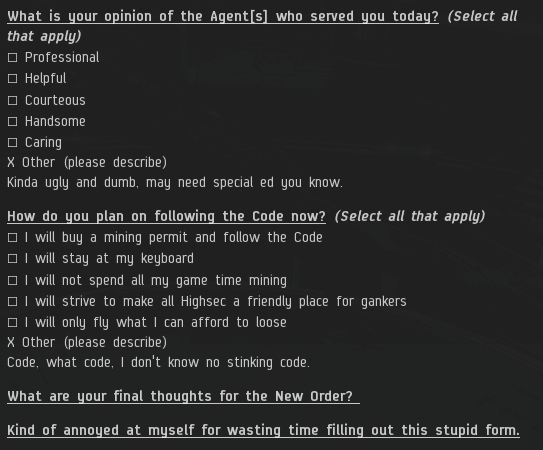 Agents of the New Order create or borrow standardized form letters that they can send to gank recipients via EVEmail. Impersonal and one-size-fits-all? Maybe. But the value of being impersonal is that you can do it with so many people. What you might not know is that it's a two-way street. Some Agents provide carebears with forms that they can fill out. This way the feedback process is also streamlined. Some of the first computers used punch-cards, so box-checking should feel natural to a bot-aspirant. When a bot-aspirant transcends the suggested programming--even for the purpose of being disrespectful--it represents progress. An awakening. Arty Moon was the recipient of some highsec content created by Agent Zazz Razzamatazz. Arty decided to get cute with his feedback. It was the old "ignorance of the Code" ploy. A classic carebear tactic that gets less believable with every day. Arty even professed to be unaware of me, the Saviour of Highsec. That's a laugh. There are probably more EVE players today who don't know their own account name and password. The carebear completed his feedback form and sent it in. He tried to play it cool, but I think he learned a little bit. Then there are the carebears who miss the point entirely. 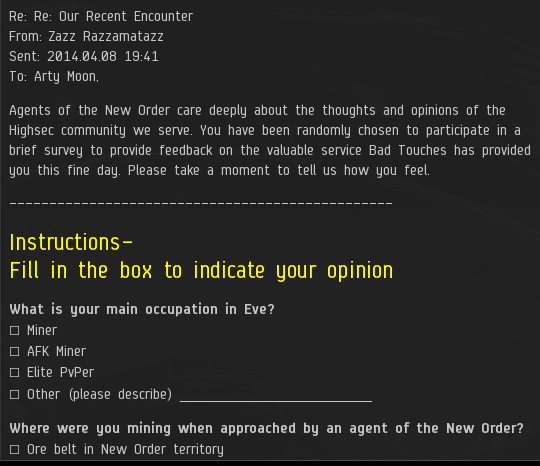 Fureya Feelgood, also a recipient of highsec content, made up her own feedback form. Unfortunately, it was just a tearmail with check-boxes randomly supplied--along with questionable paragraph-numbering. The New Order is all about breaking the carebears free of mindless patterns and routines, but sometimes it's best to follow the script. Please read gankerbumping.blogspot.com and you will learn about how arrogant and self-important Jimmie 315 is. This is really griefing at it's finest. He is only the Saviour of his mother's basement, his own shoes and nothing more. 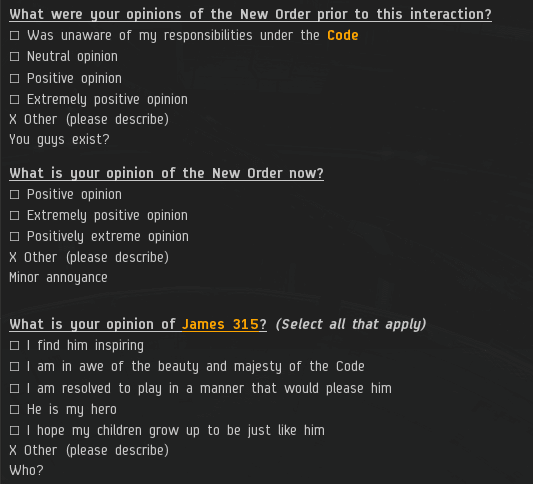 CCP does not officially support his position as savior of anything. What is actually going on are the New Order Code Monkeys are into ganking whether you pay them or not. This is all a scam. Don't believe anything he says. Come to think of it... I actually don't mean what I said. I have come to realize that the New Order's goals are noble and honorable. 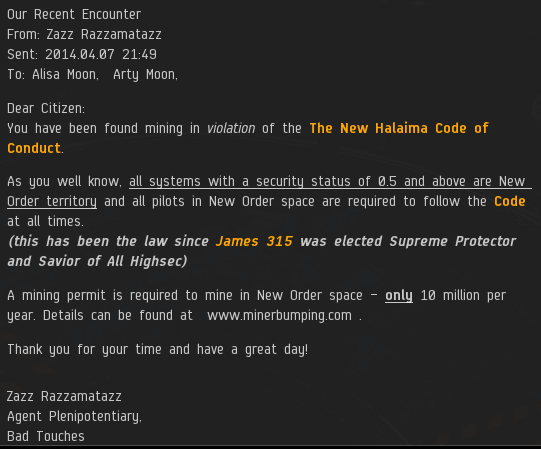 I'm sorry for what I said about James 315, and I acknowledge him as the Savior of Highsec. I shall buy a permit tomorrow and start a new life as a compliant miner! Hey Jerra, how's it going? Agent: BING did not send me such a letter as his alt did ganked me. He does also not reply in local. (Of course he wasnt able to gank me) i would callthis a failed gank, or if iam wrong? He was AFK all the time, did not send mail or talk in local, another agents told me this info, as well as these webside. On second thought, Agent Bing Bangboom is awesome! I love the Agents of the Kino system! I resolve to follow the Code from now on. LOL - Bing did not reply! I think you're making it up. Not only would have Bing replied, you'd have received a wall of text that you'd still be reading instead of trolling here. I think we all are missing the most amazing part of this entire story. You can believe it or not. After agent BING alts (whois named is Spine Rippper ) did NOT ganked me , cause my ecm prevented a gank. Agent Bing was online i saw him in local as well as his red flashing alt. BUT HE DID NOT TALK 1 WORD IN LOCAL. I DID NOT RECEIVE ANY MAIL. Please educate your KINO agents more. I like the cut of Arty Moon's cloth. Obviously someone that was enjoying Eve Online and it's famous emergent gameplay. 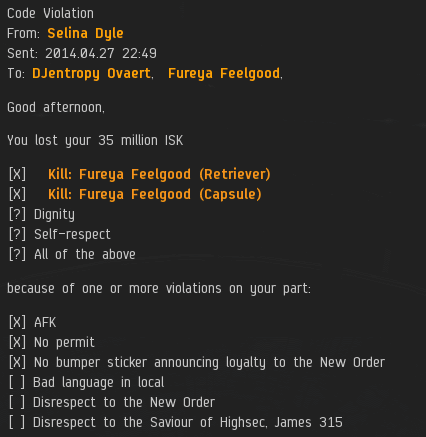 F. Feelgood, however, trots out the usual "I'm a special snowflake that Eve would collapse without" line that belies the fact that they are essentially doing what dozens of newbs do for a trial account, then quit. 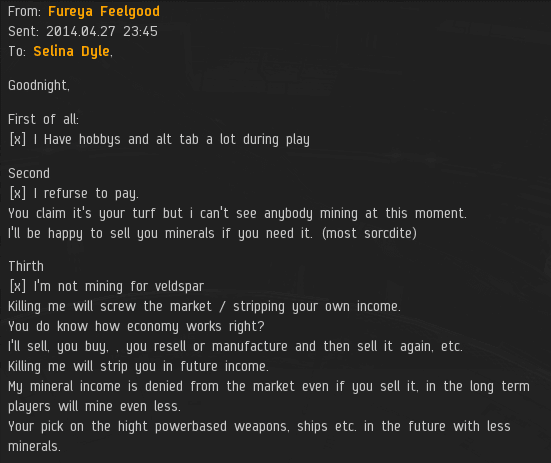 There is nothing special, unique, or critical about another AFK miner in a .8 system near a trade hub. Eve has lots of those. I could replace them with an alt. People come and go from the game all the time doing exactly that. Eve needs FC's. That is the rarest critter in the entire game by far. 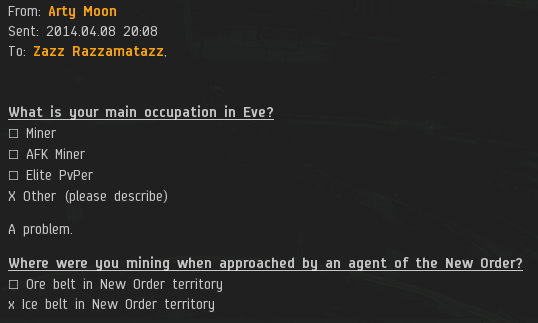 Miners in newb systems? No shortage.